Improved throughput – Parts are uploaded in parallel to improve throughput. Multi-Part upload is available either using the Amazon Command Line Interface tools (CLI) or the AWS Software Development Kit (SDK) API clients. Multi-Part upload is also available with the File Fabric M-Stream file acceleration technology. M-Stream takes advantage of multi-part upload API’s for Object Storage (S3 compatible and OpenStack) enabling File Fabric Web and desktop apps to very rapidly upload large objects. In addition to upload, M-Stream also enables downloads to be accelerated in the same way ie. Large file downloads are split into pieces, sent in parallel over multiple streams, and reassembled back into a contiguous file or object at the target, all done transparently to the end user. M-Stream maximizes network bandwidth, minimizes network latency, and increases resiliency, particularly for wide area networks. Although M-Stream is available in our Enterprise on-premises product it is also available in our hosted SaaS service where anyone can fire up a free trial. If you use M-Stream through the SaaS service then there will be two areas of limitation The first is your local speed, the second is our data centre which is restricted to 100MBps. We tested using our M-Stream technology with Amazon S3 from a bare metal instance in the EC2 regions of California (US-West-1) and Virginia (US-East-1) against S3 buckets in California (US-West-1), Virginia (US-East-1) and London (EU-West-2). As we would expect the fastest results we achieved was sending from the filesystem to S3 in the same region. The speed was about 1850MBps. We tried multiple tweaks of M-Stream, in terms of number of parallel threads etc and we always capped out at 598MBps (which is kind of a funny number). This really led us to believe that AWS is capping data transfers or has as 5GB bandwidth limitation between instances in multiple regions. It’s that last test that really pointed us in the direction of AWS S3 uploads being capped. 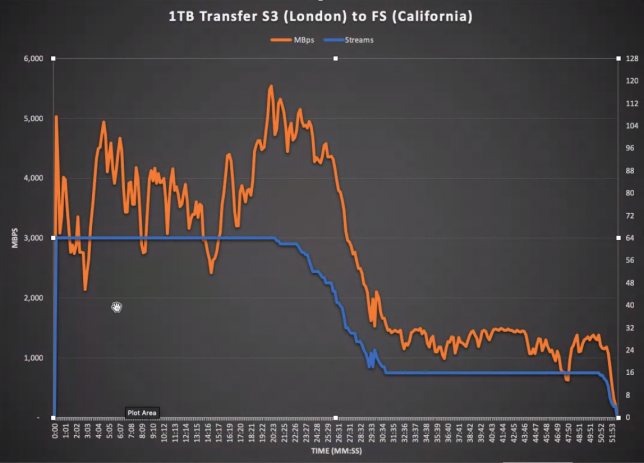 Why would California -> London S3 match all the other numbers if latency is the issue. The only references we could find to this limiting were in an Amazon blog post on how the “Floodgates” were finally open on bandwidth for EC2 instances. It appears that the floodgates are still closed if EC2 is sending data to S3 in a remote region. That being said ~600MBps from California to London is actually pretty fast and in some cases its faster than we see in many on-premises environments with Object Storage vendors, StorNext and Isilon. 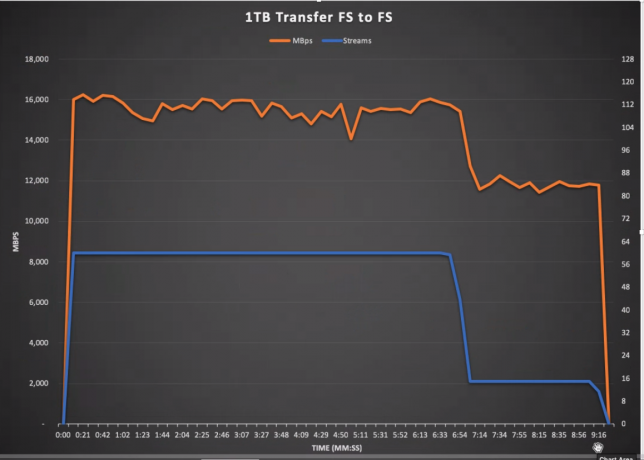 The next steps are to repeat the tests using Amazon’s S3 accelerated transfer technology to understand any increases that Amazon’s accelerate S3 transfer impact the speeds.